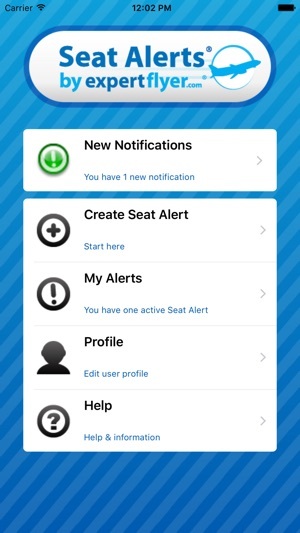 • Seat Alerts checks the seat maps several times a day. If you find and take an open seat before the next check of the alert, you won't be notified. I’ve been a happy user for quite some time and mostly use it at boarding time to see the seatmap and then request a new seat either at gate or in the Airlines’ app. This means I can be checking multiple maps on different legs quite quickly. However there was a recent update that has made it more “clunky” to use. Where one earlier could start to type the IATA codes immediately there is now a delay of about a second before the cursor appears and let you write. This is the case for the airport field and the airline field, but the flight number is fast as it used to be. It’s not critical but it’s annoying to wait for the cursor when in a rush. I’ve actually used it as I was talking to Check-in to make sure he was telling me the right information. All delays in the app can make me unable to check concurrently with the agent. I’d appreciate a fix for this. I bought a paid seat alert for specific seats. I never got an alert but I found one of those seats open checking the airline's app on my own. The developer said in addition to selecting specific seats, my alert needs to set specific flags for whether those seats are premium, paid, or blocked. I have no idea which seats are premium, paid, or blocked. I would think a modern app would automatically select the correct options if I request specific seats. But not here. Just be careful with the paid alerts. You need to have all the flags set magically to the correct settings for it to work properly. As we explained to you over email, we don't see the type of seat an Occupied seat is (premium/paid/normal) while it's Occupied, so no we can't do that automatically. Blame the state of airline technology, it's not something we have control over. 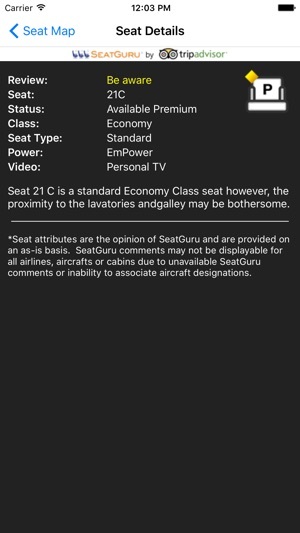 As we also explained, not everyone is as lucky as you to be able to get those elite Premium or Paid seats, so we don't alert on them by default (this is explained in our Help). Since you are a frequent flyer, you would probably know that a window seat is a Premium seat not available to everyone. Downloaded the app, entered a flight I’m already booked on, and the app had the wrong seat configuration. I’m already in 13F, but the app didn’t show a row 13 at all. Plus, I need to select an option for “Windows in front of [my specific seat]” OR “Exit Row Window”. 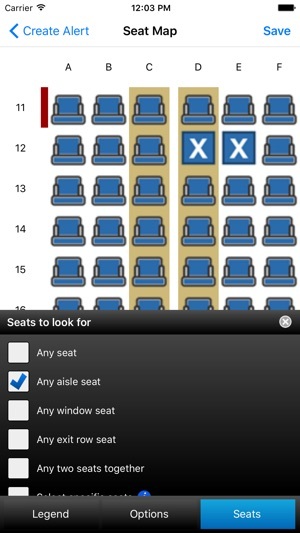 You can’t do this with this app unless you pay a buck to manually pick the seats you’d like. The app already has advertising, so why microcharge people? 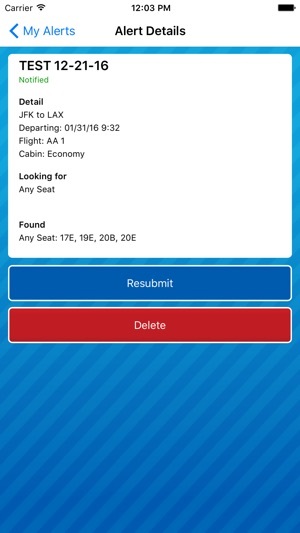 There are truly free seat finder apps out there that are better. I uninstalled this one immediately.